Meredith is an exceptionally beautiful woman used to having fun and getting attention. When she loses her job because she is too interested in fashion and her boyfriend, and then that same boyfriend cheats on her, Meredith decides to get away from it all in Hawaii. Her trip to Maui, however, does not go exactly as she had planned and ends up changing her life. Meredith is selfish and shallow, and since the omniscient narrator allows us to know what Meredith is thinking, it is not possible to give her the benefit of any doubt. I did not want to identify with Meredith at all throughout the first half of Hana-lani, given how mean and conceited she was in both thought and action. This made reading the book different from reading other novels where one identifies with the main character. However, my negative reaction to Meredith-- wanting to separate rather than to identify-- prompted me to reflect on the qualities I would like to nurture in myself. While reading the book, I more than once took a moment to assess my own life, looking for ways that I might be selfish or hurtful to others. By showing readers a character we do not want to emulate, Sunderland gives us the chance to define ourselves, to take stock of what is important and of whether we are living up to our ideals. Sunderland also includes inspiring characters who, though they play smaller roles in the story, offer examples of positive, generous behavior that readers will be able to admire. Meredith crosses paths with these characters after a plane crash takes her outside of her usual circles. 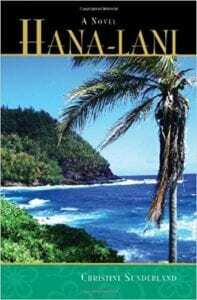 She finds herself at Hana-lani, the home of Nani-lei, who is taking care of her grandson, Henry, and his six-year-old daughter, Lucy, while they recover from the death of Lucy's mother. Nani-lei's love, wisdom, and sense of family are a striking contrast to Meredith's worldview. Hana-lani is truly another world to Meredith. Frequently the airport is closed or the phone lines down, making this remote island town that much further removed from the fast-paced life Meredith has left behind in San Francisco. Sunderland's descriptions of the Hawaiian landscape and culture are entrancing. Readers will share some of the peace that Nani-lei's family and their visitors experience at Hana-lani. Although I did not identify with Meredith as a main character, it was easy to feel compassion for her. As the story progresses, we learn more about Meredith's childhood, and the fact that her only brother died in Iraq. Meredith is able to disappear from San Francisco for weeks without anyone really missing her. She is truly alone. Rather than disliking Meredith, I felt sad for her from the beginning. My immediate reaction to Meredith was a desire to clarify my own values. Meredith begins to do the same, as she stays on at Hana-lani, cared for by a loving matriarch who seems to accept and not judge her, and is part of a family almost for the first time. Hana-lani is the story of Meredith's redemption. Sunderland's characters are sometimes preachy about their political and religious views. The dialogue feels at times like a vehicle for lecturing to the reader rather than being an integral part of the story. For example, Henry says, “Our military are a perfect example of love, patriotic love,” (pg. 103). This was somewhat jarring to me in comparison with the dreaminess of the setting and the subtlety of the developing story. However, the story was well-written and believable apart from these moments in the dialogue. Meredith's transformation, in particular, is convincing. It happens slowly. Though readers will suspect from the beginning that Meredith is going to grow and change, the story has enough twists and turns to keep it interesting. Hana-lani does not end with anyone living happily ever after. Instead it ends on a note of hope that has been building as the story unfolds. Feeling hopeful for Meredith, and for six-year-old Lucy, as well, will allow readers to feel hope in their own lives. We know as we read the book that change and redemption are sometimes elusive. They will not happen for Meredith unless she wants the transformation and is also willing to work for it, a lesson that will bring hope and direction to readers' lives. Quill says: A well-crafted novel with a hopeful message.